By the late 1950s, Britain’s Rootes Group had gained a worldwide reputation for building solid and dependable–if a bit stodgy–sedans like the Humber, Hillman, Talbot and Sunbeam. Introduced in 1959, the stylish Alpine roadster marked the company’s entry into a growing sports car market then populated by Austin-Healey, MG and Triumph. But the Alpine, with its folding top, roll-up windows, plush interior and compliant suspension, soon became known more as a civilized GT rather than a true sports car. While this roadster’s creature comforts appealed to many buyers, hard-driving enthusiasts seemed to prefer the Alpine’s rowdier rivals. So Sunbeam set its marketing people to work finding ways to punch up the Alpine’s reputation as a real competitor. Endurance racing seemed to offer a good opportunity. And in America–a market with huge potential–the 12 Hours of Sebring was the most important road race of the year. For 1961, the Rootes factory prepared a trio of Series II Alpines, finished them in Wedgewood Blue, and shipped them to Florida. After 12 hours on the rugged airport circuit, results were mixed. Two of the Alpines had expired, but the third, driven by Peter Proctor and Peter Harper, survived to finish third in class behind a pair of MGs. 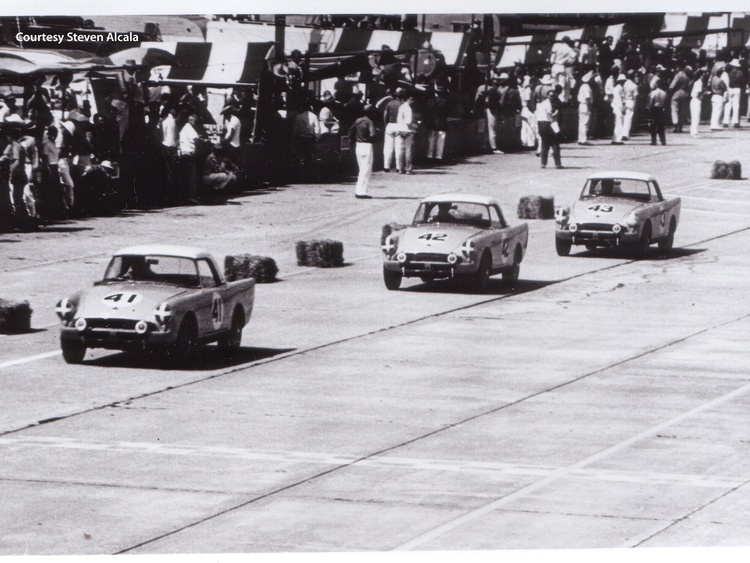 The next year, armed with experience, Rootes Motors returned with three freshly prepared Series II Alpines. While these right-hand-drive roadsters–painted Seacrest Green with white hardtops–appeared mostly stock, the competition department had performed a host of modifications, including replacing the doors, hood and trunk lid with weight-saving aluminum versions. 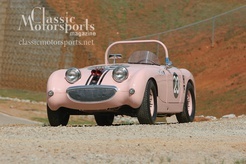 The factory’s goal was to beat the three-car MGA team fielded by British Motor Corporation. The Rootes Motors entries wore Nos. 41, 42 and 43. On the first lap, No. 41–piloted by Peter Harper and Peter Proctor, with Harper behind the wheel–was sideswiped by a Don Yenko Corvette and knocked off the track. Although the Alpine’s right side was badly scraped, this entry soldiered on. After 25 laps, the No. 42 Alpine, driven by Ken Miles and Lew Spencer, suffered engine failure and retired. Joe Sheppard and Tom Payne drove No. 43. From the start, this duo managed to stay out of trouble and remain competitive in class. After his ride expired, Lew Spencer also shared stints behind the wheel. But toward the end of the 12 hours–with Spencer driving–the engine sounded a death rattle. Thinking the car was finished, he pulled into the pits and climbed out. But this Alpine still clung to life. With only a couple laps left, hoping to get an official finish, Team Manager Norman Gerrad sent Joe Sheppard back out with instructions to nurse the car around. To everyone’s amazement, despite a broken connecting rod and a hole in the crankcase, this Alpine managed to cross the finish line under its own power–ninth in class and 32nd overall. The No. 41 Alpine, which had bounced off the Corvette, did even better. Harper and Proctor brought this car home third in class and 15th overall, finishing one lap ahead of the closest MGA. For the 12 hours, it averaged 74.97 mph, significantly faster than the team Alpines of the previous year. 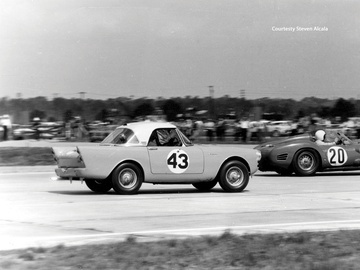 After the race, all three Sebring Alpines remained in the U.S. and joined the club racing scene. Over the years, these racers passed through a succession of owners and saw hard track duty. As time passed, more of their unique competition parts were removed, and their Sebring history was gradually forgotten. Clapped-out race Alpines–even those prepared by the factory–had little value. Decades passed. It’s 40 years after the 1962 Sebring race. Sunbeam expert and historian Steve Silverstein is hustling up I-95 on his way to Vermont. He’s chasing information he thinks may help him verify that a recently rescued junkyard Alpine is one of the lost Sebring racers. Steve came down with the fever to seek out Sunbeams after he made an unexpected find. Looking for an engine for his Series V, he ran across a Series IV Alpine parts car near his home in Marlborough, Massachusetts. The price was right and it was piled with parts, so he dragged it home. Convinced that other significant Sunbeams lay hidden, Steve prowled the Web, followed up leads, studied old pictures, made calls, and fired off emails. 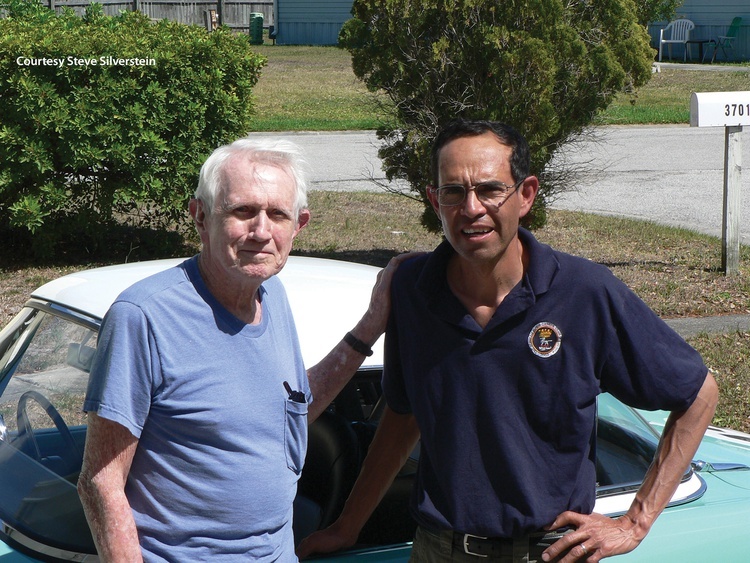 He developed a knack for finding forgotten cars and the guys who raced them. These days, his computer is crammed with flow charts of Sunbeam history, period photographs and race results, and he’s assembled a worldwide network of connections. He’s the go-to guy for finding Sunbeams with racing history, and he’s since branched out into other marques. The man is being modest. No trail is too cold, and no obscure detail escapes him. If there were a “CSI: Sunbeam” TV series, he’d be in line for a leading role. 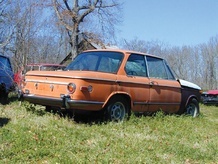 Not long after Steve discovered his SCCA championship car, an enthusiast called him to talk about a parts car for sale in New Jersey–this one a rusty Series II right-hand-drive Alpine rescued from a Pennsylvania junkyard. This tall-finned derelict was so forlorn no one seemed to want it. But Steve was intrigued. He knew that precious few early right-hand-drive Alpines made it into the U.S., and nearly all he’d seen had been brought back by returning servicemen. Still, with those elusive factory racers in mind, he asked for pictures. Looking at the images, he perked up when he noticed the junkyard Alpine had no gas cap on its right flank. Other views revealed modifications to the car’s wiring, electrical system and trunk. But the pictures also showed rust on the doors and hood, so he knew they were not aluminum. Unless those panels had been replaced, it seemed unlikely this car was a factory racer. Despite the conflicting evidence, he was curious enough to head for New Jersey. His top-to-bottom examination revealed many interesting changes from stock, and he documented all of them with detailed pictures. Steve–always excited around old Alpines–was starting to get a buzz. And that buzz was still with him on I-95 to Vermont. 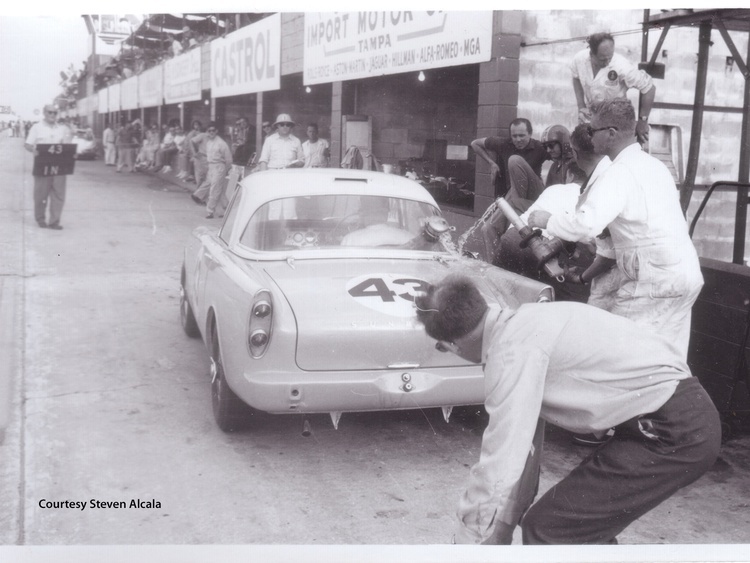 Sebring Alpine No. 41 (the Harper/Proctor entry), which had survived the years relatively unscathed, surfaced a few years earlier in California and had recently relocated to the Mountain State. Steve wanted to compare his pictures to this known survivor. One by one, he checked No. 41’s modifications against those in his photos, and the cars appeared to be identical. Then another piece of evidence fell into place: Steve discovered that the body numbers were sequential, telling him the cars had been pulled off the line together. Despite the New Jersey car’s steel doors, hood and trunk lid, he figured it had to be Sebring Alpine No. 43. Convinced beyond a reasonable doubt, he picked up the phone. 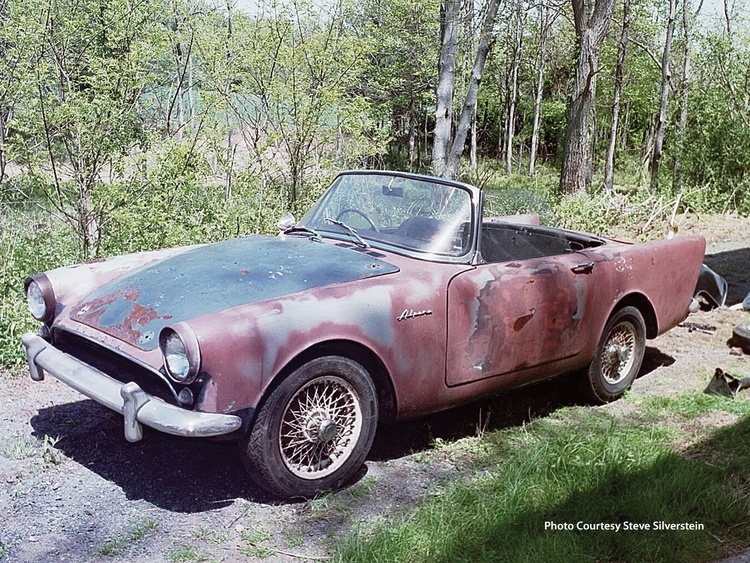 The guy he had in mind to bring this racer back to life was a Sunbeam fanatic as well as a skilled fabricator with the experience to tackle this job. After all, he had even built and raced his own Sebring Alpine replica. Steven, who runs a restoration shop in El Segundo with business partner Rick Fitzgerald, may have been destined to own this car. He had always been attracted to the high-finned Alpines and loved racing his Seacrest Green Sebring Alpine replica. Through the years, he had accumulated a pile of Alpine parts as well as stacks of historical items and photographs of the Sebring cars. He had honed his skills by restoring dozens of Alpines and Tigers, along with many exotics, including aluminum-bodied classics. As it turned out, Steve Silverstein is not only a good researcher; he’s also a good salesman. With a little persuasion, Steven decided to take the plunge, knowing he would never get another chance. Of course, by the time he made the deal, the Alpine’s owner had learned of its Sebring history. “The price tripled,” Steven recalls. First, the Alpine was completely disassembled, which revealed the details of the numerous factory modifications, including leading over the production fuel filler opening, changes in the trunk for the battery mount, an extended-range gas tank behind the seat, extra welds intended to stiffen the shell, and even more welds on many mounting brackets. “Extra welds on the horn bracket seems like overkill to me,” Steven says. In the stripping process, he removed gobs of old filler and cut out the many rusty areas. The lower rockers were badly eaten, as were the lower fenders. Previous owners had drilled extra holes everywhere. The front valence was damaged, so it was cut off, taken apart and repaired to be reattached later. The damaged front frame horns were also cut off, and replacements were welded in. Each part and assembly was evaluated and stored for repair, reassembly or replacement. Many items were sent out for plating. The stripped body shell was installed on a rotisserie, sand-blasted and cleaned. Then, all the metal repairs were made and new patch panels were welded in. Next came body filler, days of smoothing and sanding, and finally a primer coat. Once the underside was finished, it was painted Seacrest Green. So was the engine compartment. Ever so slowly, the work progressed, often after business hours, during the weekends and on holidays. By 2007, the Alpine was trial-assembled with an engine, running gear, fluid lines and a wiring harness so Steven could check fitment and clearances inside and out. 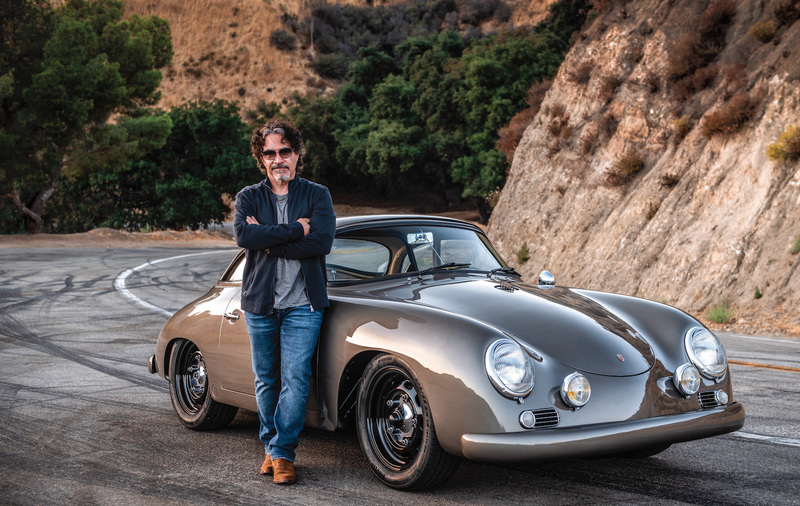 Since the factory aluminum panels were long gone, Steven spent countless hours fabricating a pair of steel-framed, aluminum-skinned doors and a similarly constructed trunk lid. He fitted the finished panels to the car and carefully gapped them. He intended to build an aluminum-skinned hood but hadn’t yet found the time. With the precious panels safely in his shop, he set about verifying them. When he removed brackets, he found Seacrest Green paint. When he sanded off layers of old paint, he found remnants of white roundels and original black numbers. On the passenger-side door he found a patch over the mounting area for the number light. Holes in the hood exactly matched those in a 1962 photograph of No. 43 taken in the Sebring pits. For days, he puzzled over the trunk lid. Everything seemed correct, but he could find only one latch-mounting hole, while the corresponding latch had two holes. Finally he examined the Sebring pit photograph again, this time with a magnifying lens. He could clearly see that the latch’s bottom hole was empty. During preparation all those years ago, an assembler had neglected to drill a hole for the second rivet. Steven knew then that he had the original factory panels for his car. Once the car was fully primed, assembled and running, Steven took it to a couple autocrosses and open track events; Dan did the driving and testing. After each outing, they sorted and made improvements. Finally, Steven was satisfied enough to complete the final bodywork in preparation for painting. His partner, Rick Fitzgerald, finished the exterior paintwork in 2009. Next came the slow and meticulous final assembly, inside and out. They also added necessary safety upgrades to comply with the rule book–including a fuel cell and fire system–while keeping the car as close as possible to factory racing trim. Since the Rootes competition department had made few speed modifications, the Alpine running gear remained mostly stock, including its four-speed transmission with electric overdrive and open rear end. 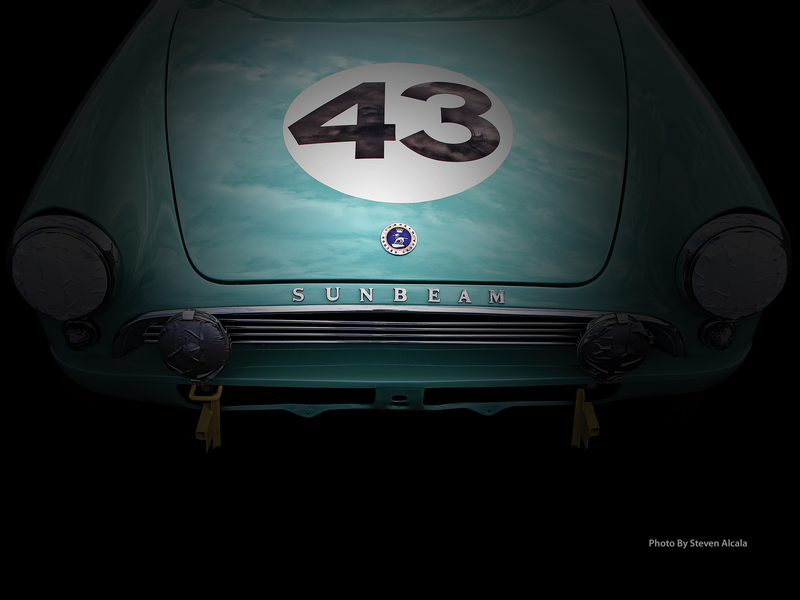 By June 2009, the Sebring Alpine was finished enough to make its official debut at a Sunbeams United National/International meet in South Dakota, where it was the hit of the show. Since a restoration like this is never really finished, Steven continued to make refinements while he enjoyed showing the car and competing in vintage racing events. 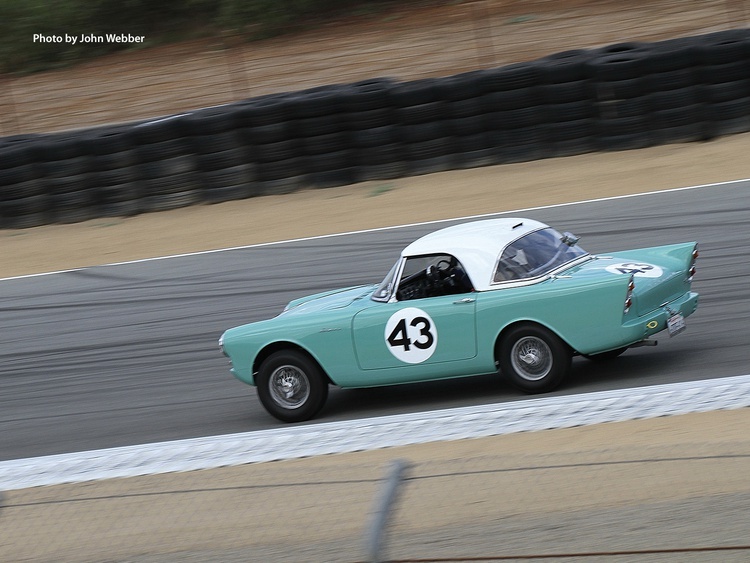 Author’s note: When we caught up with Steven, Jane and their Sebring Alpine at the 2012 Rolex Monterey Motorsports Reunion at Leguna Seca Raceway, they were again using the car the way the Rootes Competition Department intended. And when it wasn’t hustling around the famous road course, the immaculate racer drew a crowd in the paddock. In all, it was just another successful weekend for the only factory-prepared Sebring Alpine that’s still on the track. As for Steve Silverstein, word has it that he’s chasing yet another old race car or two. We’re betting he finds them. Two weeks after the Sebring race, as the highest-finishing Alpine, No. 41 was displayed on the Sunbeam stand at the 1962 New York Auto Show. But was it? Steve has unearthed documentation that reveals the Alpine on display was actually our featured car. Possibly because No. 41’s accident damage could not be repaired in time, No. 43 took its place (with a number change). The real No. 41 was heading to California, where a month later its new owner, Ted Block, started racing it in club events. Traces of the repairs needed after its encounter with Yenko’s Corvette may still be seen on the right side of this car. After the New York show, Rootes gave the displayed car (No. 43) to New Jersey Rootes dealer Len Amato so he could race it in Northeast SCCA events to help promote the Sunbeam Owners Club. Amato raced the car with some success and sold it a few years later. Since the all-aluminum doors, hood and trunk lid were not SCCA-legal, Amato removed them and installed steel panels. No. 43’s next owner, Scott Deitz from Pennsylvania, bought it to compete in hillclimbs and other events. In the late ’60s, he traded the Alpine–then tired and missing many of its racing parts–to an enthusiast in exchange for a Formula car. After this trade, the car passed through a few more racers’ hands and saw some street use before finally ending up in a Pennsylvania junkyard. Al Costner, an Alpine racer from Long Island, acquired the aluminum panels from Amato and later sold them to a racer in Indiana. Those panels continued to migrate west and ended up with a collector in Washington State, where Steven Alcala found them. No. 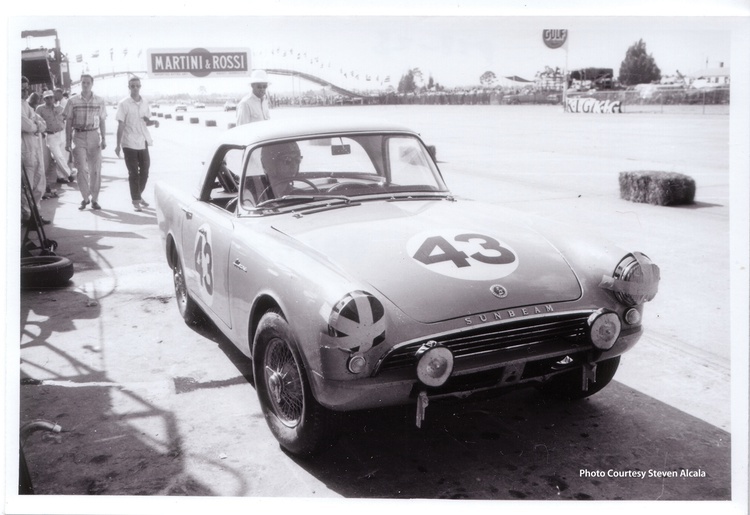 42, the remaining unaccounted-for 1962 Sebring Alpine, also went to the West Coast, where it competed in club races in the Bay Area. Some time later, reportedly in Southern California, it caught fire and was partially destroyed. According to the story, the remains were dismantled, although rumors persist that some components remain. The fates of the three 1961 factory Sebring Alpines (two right-hand-drive, one left-hand-drive) remain unknown. By some accounts, these cars were shipped back to England after the race, although Steve’s research indicates this was not the case. In fact, he tracked these cars through owners in Salt Lake City, Miami and Monterey Park, California, before the trails went cold. He has not been able to locate any of them. This car was in my race group at The Rolex Monterey Historics in 2013, well prepare for an endurance race, but really lacked the grunt needed for the sprint races of "modern" style vintage racing.